A vertically extended structure or object in Saturn's F ring casts a shadow long enough to reach the A ring in this Cassini image taken just days before planet's August 2009 equinox. The structure can be seen as a bulge within the bright core of the F ring on the left of the image. 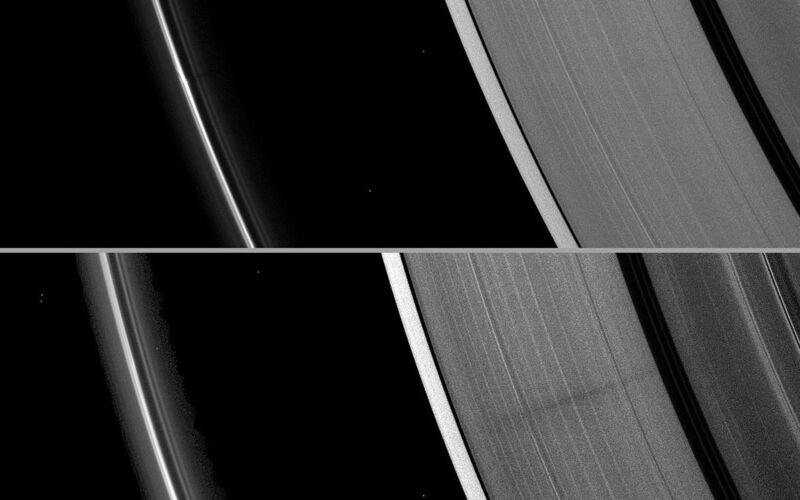 The structure rises far enough above the ring plane for the shadow to be cast across the Roche Division and onto the A ring. The shadow is barely visible stretching across the top right quadrant of the image. 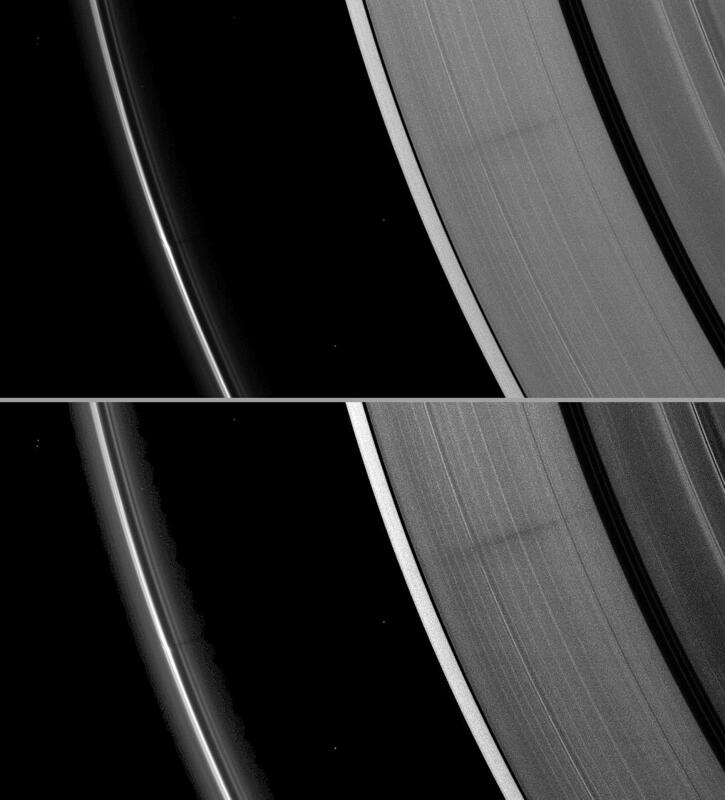 The shadow appears very faint here because this view looks toward the unlit side of the rings. This image and others like it (see PIA11662 and PIA11663) are only possible around the time of Saturn's equinox which occurs every half-Saturn-year (equivalent to about 15 Earth years). The illumination geometry that accompanies equinox lowers the sun's angle to the ring plane and causes out-of-plane structures to cast long shadows across the rings. Exact equinox at Saturn begins August 11, 2009, and lasts about four days. Shadows have grown longer as those days draw near. Cassini's cameras have spotted not only the predictable shadows of some of Saturn's moons (see PIA11657), but also the shadows of newly revealed vertical structures in the rings themselves (see PIA11654). The A ring in the first (top) image has been brightened relative to F ring to enhance visibility of the ring and shadow. The entire image in the second (bottom) version has been contrast enhanced. Bright specks in the image are background stars. This view looks toward the unilluminated side of the rings from about 28 degrees above the ring plane. The image was taken in visible light with the Cassini spacecraft narrow-angle camera on July 30, 2009. The view was obtained at a distance of approximately 1.8 million kilometers (1.1 million miles) from Saturn and at a Sun-Saturn-spacecraft, or phase, angle of 96 degrees. Image scale is 10 kilometers (6 miles) per pixel.